Dieskrad is a bug like looking creature with long horns and sharp teeth from Dimension Ebrik. Little else is known about Dieskrad. 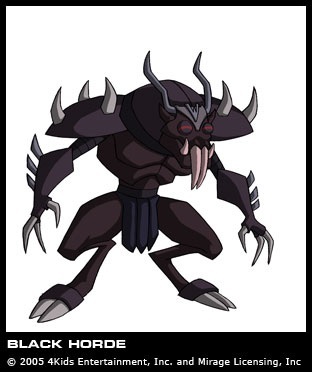 Dieskrad (or at least his likeness) first appears as some of the Black Horde — created from Kirby’s drawings — that storm the castle in Kirby’s imaginary world. Many of them proceed to attack both Donatello and Kirby, but are eventually defeated. Later in the series, Dieskrad is one of the warriors who entered the Battle Nexus Tournament in competition for the title of Battle Nexus Champion. Though he passed the preliminaries and went on to defeat both Albert and Staffin the first and second rounds (respectively), he ultimately fell to La in the third round. After being transported to the medical area, Dieskrad is seen pounding the ground in frustration, though he appears genuinely startled moments later when Raphael accidentally incapacitatesZat. Before the Tournament begins, Dieskrad (or at least another of his species) is also seen during the Djinn’s story of Master Splinter’s championship victory. During this flashback, Dieskrad spars with many of the other monsters from Kirby’s imaginary kingdom. Strangely, however, this version of him wields a morning star. Dieskrad later returns for the pre-fight exhibition duringMichelangelo’s grudge match against Kluh, at which point Dieskrad is seen battling both La and Zat.